Joining the deal-of-a-day website Groupon was a great decision for the blog; their daily emails often include ideas for things I've never done before, all offered at a huge discount. A great thing, I suppose, except I've ended up buying handfuls of coupons for things I don't really need or want, just because they're on sale. I'm a sucker. On Day 332 I redeemed one of these Groupons I didn't need -- this one for a Formostar Infared Wrap offered at Solar Dimensions Tanning Salon in Buckhead. It was the thing I've never done before. The company's user-friendly website made buying the Groupon pretty easy. Making an appointment to use it was anything but. I called several times with dates and times in mind and each time they told me those times were unavailable. Clearly I wasn't the only one with an affinity for discounts and quick fixes for calorie burning. Day 332 was the first opening they had, and I booked it immediately. When Day 332 arrived, I packed a bag full of the clothes that I would need so that I could leave straight from work. I left my office far later than I'd intended to, however, and had to race to Buckhead to make the appointment on time. The woman behind the counter was sweet, but I could tell she was annoyed that I was a few minutes late. 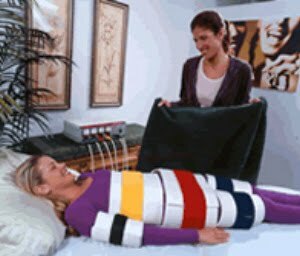 She could tell that I didn't know what I was doing; she knew, before I told her "diarrhea of the mouth" style, that I was new to the Formostar Infrared Wrap and therefore had lots of questions. She pointed at a dressing room in the back and firmly told me to change into the clothes I brought for the session. I headed back there and following the instructions on the salon's website, put on sweatpants and a long-sleeved t-shirt. When I was ready, the lady walked me down a hall past other rooms of tanning beds and spray tanning booths. The room we entered had a bookshelf with a stack of magazines and a television with a built-in DVD player. There were several fake plants and something to lie on that looked like a cross between a doctor's examining table and a massage table. She motioned for me to put my things in a chair by the door, and then she instructed me to lie on the table and, "get comfortable." For some reason, when she told me to get comfortable, I immediately started to feel uncomfortable, in a "what have I gotten myself into," kind of way. So, I did what comes naturally to me, and I started chatting with her, all while she began strapping what was the equivalent of heating pads to my entire body, over my clothes. With the exception of my head and neck, I was completely covered in these contraptions. I told her how difficult it had been for me to book an appointment. She nodded and said the wraps were very popular and thanks to the Groupon, they'd seen a lot of traffic. She also suggested I go ahead and book my next appointment before I leave. Optimal results, she said, are achieved after getting regular wraps. Those tricky Groupons -- they bait you with the discount in hopes that you'll return for more at the regular price. I nodded while giving her a look that said, "This is probably a one-time only deal for me." But I don't think I needed to. She'd been treating me like a cheap Groupon client since I'd walked through the door. She knew. By that time, she'd finished wrapping my arms, legs, and stomach with the heating pads. She said she'd turn them on and she'd be back to get me in an hour. I was quite constricted with all of the wraps, so she offered to start a movie for me or get me a magazine from the stack on the shelf. A movie seemed silly since I'd only be in there for an hour, so I requested she bring me some magazines. She laid a few on my chest, on top of the wraps, and then exited the room. Within a few minutes I could feel the pads heating up and I sensed that what was supposed to be happening was indeed happening. And then it occurred to me that I had absolutely no idea how this wrap actually worked. I talked about a lot of things with the woman who had outfitted me for this ridiculous treatment, but not once did I ask her what was going to happen to me, or my body. Could I drive? Could I drink? Did the wrap have any side effects? I had absolutely no idea. But it was on sale! Who cares if it could kill me?! Despite having no idea what the wrap was or was not doing, I settled in for an hour of forced relaxation. I was away from work and the constant ringing of phones; there were no computers or Blackberries, and no loud television blaring in my ear. It was just me, lying still on a table with four tabloid magazines. What a treat! I usually get my celebrity gossip from websites, but here I was about to dive into the actual hard copy of the magazine. I picked up an US Weekly and read the cover excitedly, only to realize the stack of magazines was at least three months old, full of gossip that had already long been disproved. Huge bummer. Eventually I dozed off and woke up lying in a pool of sweat to the front desk lady telling me that even though my hour wasn't finished, the next customer had arrived and since I had arrived late, I would have to get up. This news was fine with me. I was terribly uncomfortable and dreadfully hot and highly skeptical that I'd just wasted my money on this little experiment. I mean how could I have possibly burned 900 calories lying on a table and sweating? Maybe I lost some water weight, and maybe I even detoxified a bit having sweated so much, but I remain highly skeptical that I could lose weight by sitting on that table covered in heating pads and taking a nap. If I'm ever looking to shed some pounds, I think I'm going to have to go about it the old fashioned way -- with good old diet and exercise. But if sweating like a pig in a wool sock while reading outdated celebrity tabloid magazines and napping on a massage table is what you're after, I know just the Groupon for you.